Amazing how quickly a vacation ends. Sadly the time to leave is upon us but we will have some very fond memories of this piece of paradise. The following are some hints and recommendations..
Hit the main pool if you want pool games, swim up bar and the like. Or if you want to play water volleyball and like a swim up bar, hit the pool by the French section. If you just want a quiet pool, the Dutch pool is the place to be. The drive to Whitehouse is 1.5 hours on a windy, bumpy road… with no stops. Be prepared. Don’t forget your sunscreen and apply it liberally and evenly… we chuckled at the many variations of sunburns we saw and how some people just slapped it on missing various parts of their exposed areas. The checkout process is painless and well organized. The airport, on the other hand was a zoo, so have lots of patience. Once you clear security (a very long line up particularly since we departed on Saturday, their busiest day), there are several shops and a pretty good food court. For those looking for a more relaxed solution, Club MoBay is a Priority Pass lounge, so if you are a member, you can take advantage of all their amenities. For others, you can buy a onetime pass for $30USD each, but depending on your wait time, it would be a good option. Sandals Whitehouse is a resort that many people go back to, time and again with good reason. We would highly recommend it! 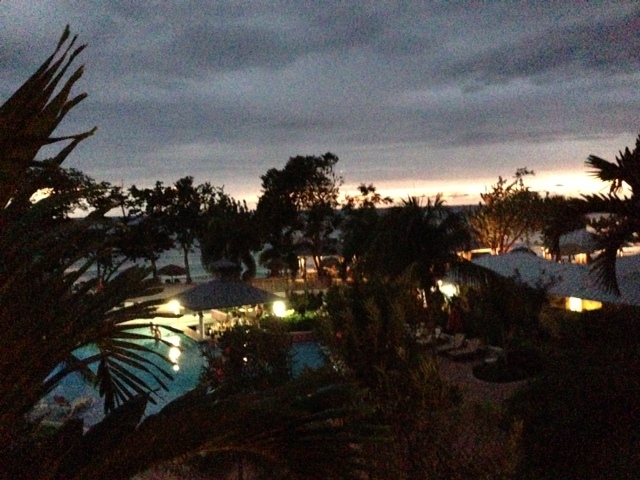 Well we are about ½ through our trip to sandals Whitehouse and we are pretty impressed. I’m not a particular fan of all-inclusives but Sandals is one of the better ones. Not having to make reservations for any of the a la carte restaurants, you just go when you are ready and the line ups are minimal. The food has been very good and because we love to eat outside, we have been very happy with the restaurant choices. There are 7 restaurants on property, so you have many choices. We have sampled most of the restaurants now whether for breakfast, lunch or dinner. There have been 2 big issues for us so far. The first is getting the beach chairs we want. It seems that you need to get up early in the morning to claim the beach chair you want, particularly if you want one under an umbrella or one of the beds. There are always enough chairs but you may have to search for one. It’s too bad people throw towels over the chairs and then don’t show up for hours. The second issue has been sand flies/fleas. I am always the one that gets bit and they are really bad here… about 20-30 bites on my legs already. Karen on the other hand, is not usually bothered by these little pests but even she has had multiple bites. Strange, but many of the other people we have met are not bothered by them at all. So, off to the resort store to buy some Off. $17 for a can of Off…yikes. Those are really our only two issues…the drinks are flowing freely, the staff is wonderful, the food is good and they have some decent nightly entertainment although we can’t seem to stay awake long enough to enjoy the full show. Crazy as this is, we met some people we know from Saskatoon here and had dinner with them tonight. It was a wonderful time but it just goes to show you that it is indeed a small world. Only a few days left and I suspect it will be more of the same…breakfast, a beach chair, a good book, lunch, a beach chair, a couple of cocktails, a good book, perhaps a nap, supper, an after dinner cocktail and a comfy chair/bed around a lovely outdoor fireplace, listen to the music and off to bed. VERY relaxing and the perfect combination of downtime. For the more adventurous, there is much more to do including snorkeling trips, diving, glass bottom boat, sailing, water skiing, paddle boards, pool activities, games room, swim up bar and much more. Sandals has a great formula and one we can highly recommend. With their many resorts there are lots of options. 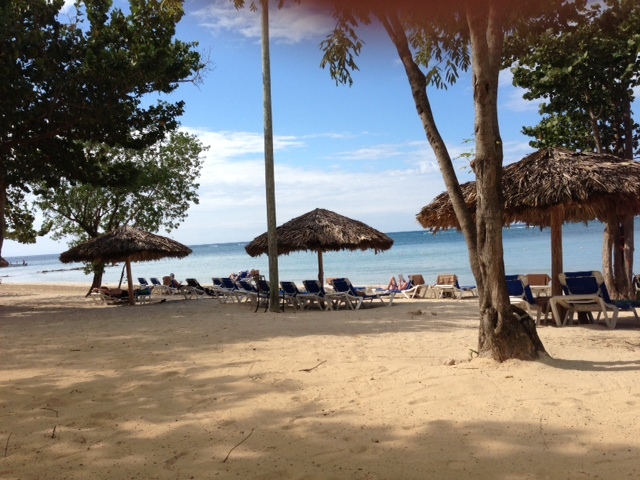 For those looking for a secluded getaway, Sandals Whitehouse may be what you are looking for. Ed’s Sandals Whitehouse in Jamaica! We’ve had quite a trip so far! Our WestJet flight to Toronto was uneventful as we like it. We had an almost 5 hour wait in Toronto but we spent our time in one of the Premium Lounges, a nice way to get away from the hustle and bustle of airport life. Unfortunately our 5 hours wait turned into a 6 hour wait and ultimately over 6.5 hours before we finally got on the plane. By now, it is snowing heavily and I am concerned we may not take off. The pilot assures us we are a go but that we need to get de-iced and we are about 6th in line for that process. We go through the process and are on the runway waiting for takeoff when the pilot comes back on to tell us that now, because of the delays and because the airport in Montego Bay will be “closed” by the time we make it to Jamaica (apparently because of some construction), the flight has been cancelled. It’s like someone kicked a hornet’s nest…passengers are not happy. The two wedding groups on board will be badly inconvenienced. When we make our way back to the terminal, we are directed to the WestJet Customer Service booth where several WestJetters are there waiting to help us. From our perspective, WestJet handles the situation very well and we are provided with a complimentary night at the Crowne Plaza and enough meal vouchers to ensure we have a nice supper and a breakfast. But you cannot please everyone in a bad situation and I know that a few were just NOT happy. No problem, mon…we are going to Jamaica. We called WestJet customer service that night as instructed and we got on a flight at 10:15 the next morning. After a short delay, we are off. Great flight crew and good flight. As we are descending into MoBay, the pilot comes on to say that we have been put into a hold pattern and after circling for a ½ hour we finally get a chance to land after which the pilot announced he was happy we finally got clearance because we were minutes from being diverted to Kingston! The immigration process went very well and after collecting our luggage, we slip into the Sandals welcome area for some refreshments and to wait for our shuttle. The shuttle takes about 1.5 hours to get to Whitehouse along a bumpy and windy road but our driver is very good and cautious. 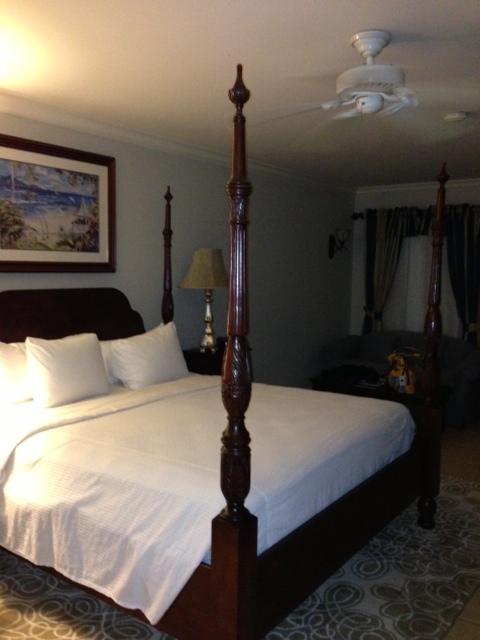 Check in at Sandals is very civilized and we are well taken care of. By now it is after 7PM so we go to the nearest restaurant called Bluefield’s Beach Club, a Jamaican cuisine outdoor restaurant for a nice meal…finally we can relax and start our long awaited vacation! Relaxing on a hammock and enjoying this view!